Shooting star blooming in spring. Shooting stars are a group of herbaceous perennials in the primula family (Primulaceae). 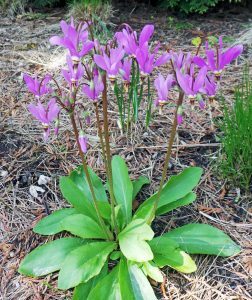 There are over a dozen species in the genus Dodecatheon, all native to North America. The most widespread and common one is D. meadia (sometimes classified as Primula meadia), variously called shooting star, eastern shooting star, American cowslip, roosterheads, or prairie pointers. The flowers of D. meadia are said to resemble shooting stars. This ephemeral spring wildflower from central and eastern US (southern Wisconsin to western Pennsylvania and south to eastern Texas and Georgia) is generally found growing in moist meadows, prairies, and open woods in zones 4-8. It is frequently used as a garden ornamental and received the Royal Horticulture Society’s Award of Garden Merit in 1993. Basal rosettes are produced from a fibrous root system in early spring. The smooth, lance-shaped leaves up to 6” long and 2½” across are emerald to greyish green, often with a reddish base and with a prominent central vein and smooth margins. The foliage only persists into summer, with plants going dormant after that. Over time rosettes may offset, with new plants developing slowly. The foliage emerges in spring (L) to form a basal rosette (C) of smooth, wavy, lance-shaped leaves (R). Flower color varies from dark pink or lavender to white. In mid-spring one or more thin but sturdy, green or red, leafless flower scapes up to 18 inches tall are sent up from the rosette of leaves. Each terminal umbel has 8-20 flowers that open in late spring. The one-inch long, dangling flowers each have five upward reflexed petals and a cluster of yellow stamens surrounding a single, purplish green style that converge to a downward point. Within any population the petals naturally vary widely in color from purple to pink or rose or white. Northern populations tend to have lavender to purple petals and southern populations skew more toward white petals, but there is considerable variation across its range. The base of the fused petals have uneven rings of white, yellow and maroon around the base. Flowers are visited by bumblebees and some other native bees to collect pollen, but not honeybees as the flowers do not provide nectar. Pollinated flowers are followed by erect oval to cylindrical mahogany-colored capsules ¼ to ¾ inch long that contain very fine seeds that are dispersed when wind blows the capsules. A flower scape emerges from the center of the basal rosette (L) with a terminal umbel with many flower buds (LC) that open in late spring (RC), with each flower pointing downward and the petals pointing upward (R). 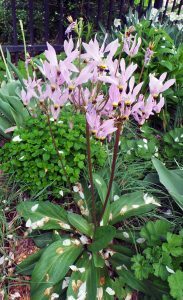 Shooting star grows best in partial shade, but can tolerate full sun in cooler zones and full shade as long as the soil is moist (but not wet) in the spring. 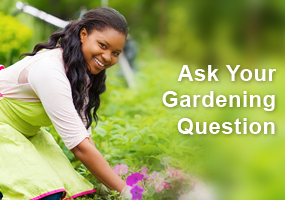 It tolerates clay soil, but prefers humusy, rocky or sandy, well-drained soils. Since it naturally dies back in summer, drought at that time does not affect it, but it does not need a dry dormant period like most of the western species do. 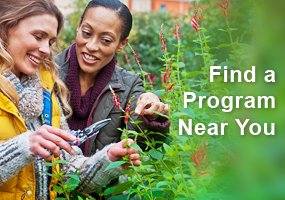 Plant it where taller plants will not overtake it until later in the season. It is not favored by deer. Shooting star interplanted with prairie dropseed (Sporobolus heterolepis) at Olbrich Botanical Gardens, Madison, WI. Use shooting start in shady native plant or wildflower gardens, woodland garden or for naturalizing. 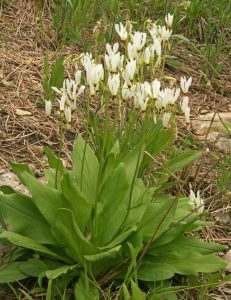 It combines well with other native spring wildflowers including bloodroot (Sanguinaria canadensis), cutleaf toothwort (Cardamine concatenata), prairie smoke (Geum triflorum), trillium, twinleaf (Jeffersonia diphylla), and woodland phlox (Phlox divaricata). In ornamental gardens place shooting star near the front of beds. In ornamental gardens place it near the front of beds and borders where the flowers can be easily viewed. It will grow up through some groundcovers, such as Vinca minor, or position them near other slower-developing plants that will cover up the senescing foliage later in the year. Shooting star is propagated from seed or by division in fall when dormant. It can be difficult to grow from seed, which needs to be sown fresh in summer or stratified (moist or dry) over the winter. Seedlings grow very slowly, taking 3-4 years to flower. D. meadia is very similar to the related, but less common (in Wisconsin, where it is found primarily in the southwestern counties on moist, shaded ledges and adjacent woods on north-facing slopes) amethyst shooting star or jeweled shooting star (D. amethystinum or Primula fassettii) which tends to have darker, reddish-purple flowers. This species is generally found in shadier locations than D. meadia and lacks a reddish tinge at the base of the foliage, but the two are best distinguished by the seed capsule, which is thin-walled, flexible, and light yellowish to reddish when dry in D. amethystinum while that of D. meadia is thick-walled and firm and a much darker reddish brown when mature. I love this flower and have 3 in my shade garden. Makes me ache for spring on this March 9 cloudy morning, will look for at plant sale, nice addition to a shade garden! I have not seen this particular flower before but will be sure to look for it this year. Love the deep pink color which would look wonderful this spring after all of the snow. Another informative article, thank you for offering these for Continuing Ed. 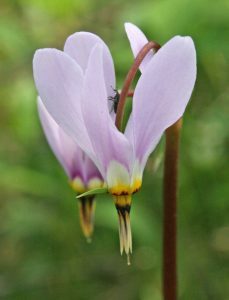 Great info and photos of Dodecatheon — good to know they are an early season pollen source for wild bees and bumblebees. I will definitely be looking at panting this in garden. I love the tall spiked looked. Will look for it at the MG sale in Spring. A new addition to my garden will be something I look forward to. Fascinating! I wonder if I could get some growing next to a Prairie Smoke patch. I see patience is required as flowering will take 3-4 years. I am developing a small shade garden under my Linden tree and was excited to learn about a perennial plant that blooms and likes shade! This flower is a favorite of mine. I was surprised to learn that it can be grown as far south as Georgia. I have a couple of these plants in my flower bed and have found that they don’t spread as quickly as I had hoped. I would like to try to propagate them by division. I now have a lot of shade in my yard, so I’m going to add this to my “try it” list for the spring. I know them as cowslip but love the name “prairie pointers.” And anything we can do to help the various bee species is a good thing! 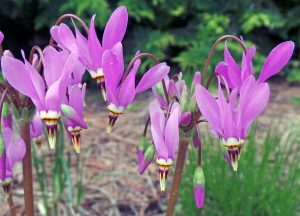 Dodecatheon meadia would be a delightful spring addition to jazz-up a median garden strip–right color, right height (less than 2 feet), deer-resistant, but not salt-tolerant. Boo Hoo if a traffic calming structure is in the winter salt appliction zone 🙁 Maybe plant near a walnut as Flower Factory’s website (advance search) lists this variety of shooting star as resistant to Jugalan’s toxin! Anyone have experience with this? 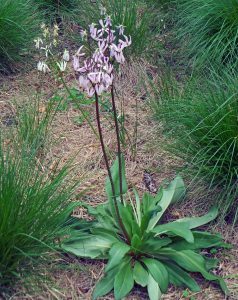 On my outing to Power’s Bluff in Arpin in spring, I remember seeing this unique plant. I live in sand country and this plant would probably not be a good choice. I am lucky to have a plant. It receives TLC all summer long. It is so-o pretty. I have some of these spring beauties in the a woodland area in the back of my yard. I love to see their cheery faces when in bloom. After reading the article I hope to try dividing them next fall when they are dormant. I was lucky to purchase a few pots at our MG plant sale, a couple of years ago. It’s a great addition for spring. I have a few of these plants and I absolutely love them. 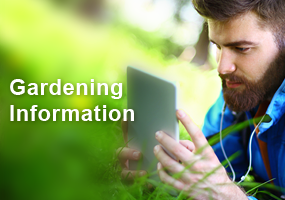 One of my goals as a Master Gardener in 2019 is to learn more about establishing woodland pollinator gardens. Even though shooting star does not produce nectar, we cannot underestimate its value to queen bumblebees who come out of hibernation in the spring and are looking for pollen to provision their nests. I was not aware that the basal rosettes of shooting star are produced from a fibrous root system, which makes it possible to divide by division in fall when dormant. I will give this a try this fall. I was not familiar with this flower’s features until I read this article, and am fascinated by every stage of its growth. 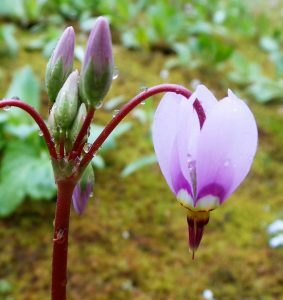 I’m looking forward to experimenting with some “Dodecatheon amethystinum” this Spring. Heck, I’m just looking forward to Spring at this point! I don’t believe that I have ever seen these before. Now that I know their favorite spots, I will be on the lookout. Wish I could find some for my yard as I try naturalizing our windbreak and woods. I, too, was surprised to learn the shooting star does not produce nectar, so our honey bees won’t visit it. They are very pretty and dainty looking. They kind of remind me of bittersweet nightshade (Solanum dulcamara). The flowers do not produce nectar. Interesting. I have observed these most lovely, dainty beauties blooming along moist and mostly shaded areas of an exempt railroad trail, now frequented by bikers and walkers……they seem to be very selective in their habitat. Was interesting to read that Shooting Stars do not produce nectar, and therefore not visited by honeybees. Upon researching further, I see that nectar is the “reward for pollinators”; had not really thought about that before. The wind must serve to assist in the pollination process for Dodecatheon, as most nectar-less plants apparently rely on the wind for this function. I look forward to seeing this elusive beauty in nature next spring! I find this along the bike trail but only in two places. I have seen this plant around and I do think it is cute. I have not tried growing it myself. I was surprised to learn that the seeds grow slow and can take 3-4 years to flower. I do wonder how well the transplant after being divided as in my experience natives don’t transplant well.